Please join, Michael Hamelin - Tufin Chief Security Architect and Mike Schuricht - Palo Alto Networks Product Manager, to learn more about Tufin's comprehensive firewall management and auditing solution - specifically tailored to next-generation firewalls. 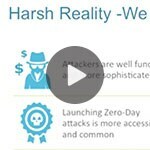 Nous vous invitons à visualiser notre webinar sur la « migration de Cisco ASA vers Palo Alto Networks » Vous verrez lors de cette session comment il est facile de passer à une plate-forme de sécurité de nouvelle génération. 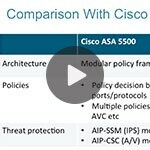 Nous vous expliquerons les différences fondamentales entre Cisco ASA et Palo Alto Networks, avec les illustrations des meilleures pratiques migratoires, des exemples et des études de cas. 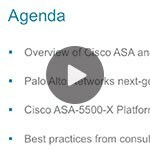 Mire esta “Migración del Cisco ASA hacia un Palo Alto Networks” Webcast. Le enseñaremos lo fácil que es moverse hacia una plataforma de Next Generneration Firewall. Nuestro equipo de ingenieros especializados le explicarán las diferencias fundamentales entre un Cisco ASA y un Palo Alto Networks y compartirán las mejores prácticas para la migración, con ejemplos y casos de éxito. 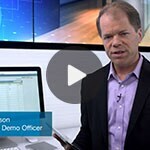 Watch this webinar to learn how easy it is to move to a next-generation security platform. Our product experts and Consulting Services team will explain the fundamental differences between Cisco ASA and Palo Alto Networks and share migration best practices, examples and case studies. Palo Alto Networks and Citrix have come together to deliver best-in-class functionality upon which you can build next-generation Cloud Networks. In addition to sharing a common vision of how networks must evolve, each company is delivering best-in-class solutions that already meet these new requirements. Proactively identify and manage abnormal, anomalous or unknown traffic in your network. 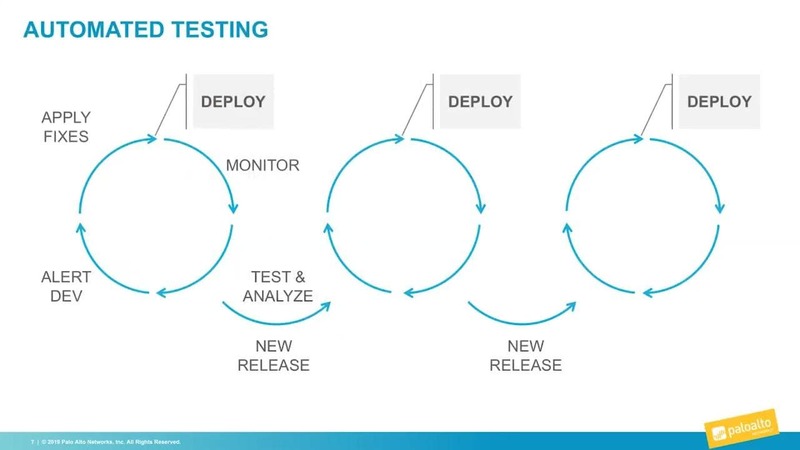 In this webinar, we will take a hands-on look at the process of managing unknown traffic using our next-generation firewall, including recommended policies for tracking unknowns, how to properly identify your internally developed applications, and even how to disrupt modern threats by identifying and blocking abnormal traffic. Palo Alto Networks and Net Optics have partnered to deliver a highly reliable and transparent threat prevention solution. 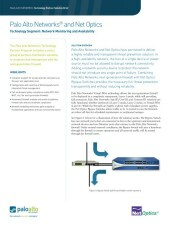 In a high-availability network, the loss of a single device or power source must not be allowed to disrupt network connectivity. Adding a network security device to protect the network should not introduce any single point of failure. 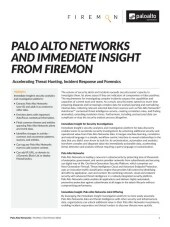 Combining Palo Alto Networks next-generation firewall with Net Optics’ Bypass Switches provides the necessary full threat prevention transparently and without reducing reliability. Sure, migrating your apps and data to Microsoft Azure should accelerate your business. But what about your security? That’s where our Next-Generation Security Platform comes in. With our network, cloud and endpoint security offerings, you can now seamlessly and securely deploy your enterprise apps and data on Azure. 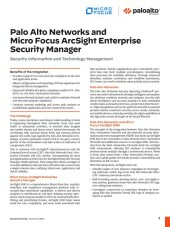 Palo Alto Networks and ArcSight have partnered to deliver unprecedented visibility and correlation of enterprise network security events. 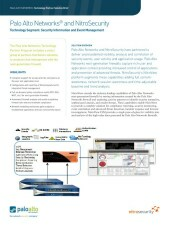 Utilizing the ArcSight Flexconnector and Common Event Format (CEF), Palo Alto Networks’ next-generation firewalls add rich context encompassing all user and application activity into ArcSight’s Enterprise Security Manager Platform. This integration allows ArcSight to correlate additional relevant data with other data sources into a single cohesive view, unifying critical user, application, and threat visibility. Palo Alto Networks and NitroSecurity have partnered to deliver unprecedented visibility, analysis and correlation of security events, user activity, and application usage. 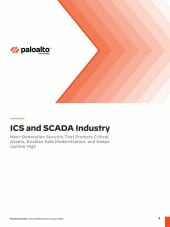 Palo Alto Networks next-generation firewalls capture rich user and application context providing increased control of applications and prevention of advanced threats. 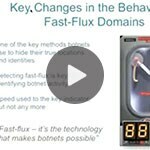 Hear the top takeaways, including noteworthy new research, tools, and techniques, from a week at Black Hat during this recap of the 2013 conference. The theft of credit card data continues to grow at an alarming rate. Not only is it costly to credit card companies and merchants, but it undermines consumer confidence. In response, the Payment Card Industry has developed the PCI Data Security Standard (PCI DSS), which includes 12 requirements for protecting cardholder data. Despite substantial investments made in securing their networks, organizations are realizing that being PCI compliant does not mean an enterprise is protected against advanced cyberattacks. Hear from Palo Alto Networks, Brocade and featured speaker John Kindervag of Forrester Research, Inc., for a discussion on how leading-edge organizations are addressing business imperatives by implementing next-generation datacenter architectures, infrastructures, and network security. Learn three ways to integrate better security into critical, highly available networks while keeping the primary mission of the datacenter (serving available, high-performance applications) at the forefront. Security challenges in municipalities and counties and how we solve them. A brief discussion and demo on the increasing need to securely enable applications that use SSL and control SSH by enforcing native usage. 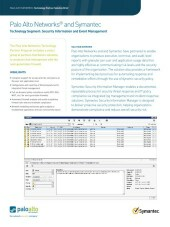 Palo Alto Networks and and Symantec have partnered to enable organizations to produce executive, technical, and audit-level reports with granular per user and application usage data that are highly effective at communicating risk levels and the security posture of the organization. Social networks are pervasive among most of today's Internet users. They are also important tools used by employees and organizations for outreach. Unfortunately, social networks are also rife with risk that can lead to exploitation of accounts, end points and loss of reputation. In this webcast, learn the risks social networking brings to enterprises, including targeted attacks, phishing, exploitation of accounts, spread of malware and loss of company reputation. 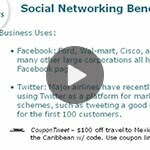 Then learn how to enable valuable social networking tools securely. 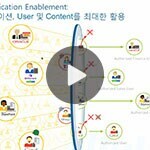 This video is an overview and demo of Palo Alto Networks Next-Generation firewall in Korean. Organizations require a network security platform capable of creating relevant security policies by application, user and content for all of their network segments. 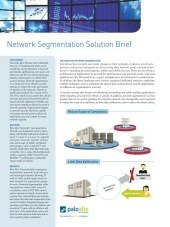 Learn more about the need for effective network segmentation, and how a Palo Alto Networks security platform can be at the center of any segmented network. Join Nir Zuk, network security visionary and founder and CTO of Palo Alto Networks, for a live interactive online interview with security analyst Mark Bouchard, CISSP. Nir Zuk has been delivering innovation to the information security industry for the last 20+ years. He was one of the developers of stateful inspection firewall technology, worked on the world's first intrusion prevention and detection appliance and is now pioneering next-generation firewalls. 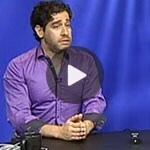 Watch Nir speak about the state of the information security industry and then pose your toughest questions to him.